323 Reindeer Killed In Lightning Storm In Norway : The Two-Way The reindeer died on a mountain plateau in central Norway. "I don't remember hearing about lightning killing animals on this scale before," says a Norwegian environmental official. The lightning storm killed 323 reindeer on the Hardangervidda plateau in central Norway. The government estimates that about 10,000 reindeer live in the area. The Norwegian government says 323 reindeer were apparently struck by lightning last week and died. The animals lived on a mountain plateau in central Norway called the Hardangervidda. The rugged alpine landscape is (usually) a good place for a reindeer — delicious lichens grow on exposed rocks, and the area is protected from development because it falls within a national park. The Norwegian Nature Inspectorate wrote in a press release that officials discovered a field of carcasses on Friday while they were supervising hunters in the area. The agency estimates about 10,000 reindeer live on the plateau each year. 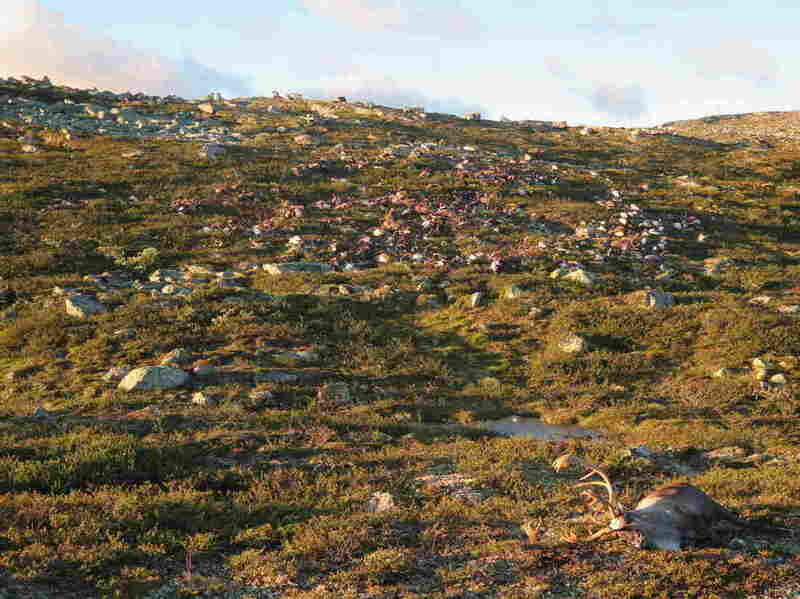 Officials from the Norwegian Nature Inspectorate discovered hundreds of dead reindeer on a mountain plateau after a lightning storm. "We've heard about animals being struck by lightning and killed, but I don't remember hearing about lightning killing animals on this scale before," Norwegian Nature Inspectorate spokesman Knut Nylend tells the Norwegian news outlet NTB, as cited by The Local. "Reindeer are pack animals and are often close together. During a heavy thunderstorm, they may have gathered even closer together out of fear," he told the news site. No people were reported injured in the storm. Officials from the agency traveled to the site Sunday to count the animals and take samples to test for disease. They also euthanized at least four animals they found there, according to the press release. The disease testing will look for evidence of viruses that attack cervids — the blanket term for deer, elk, caribous and reindeer. 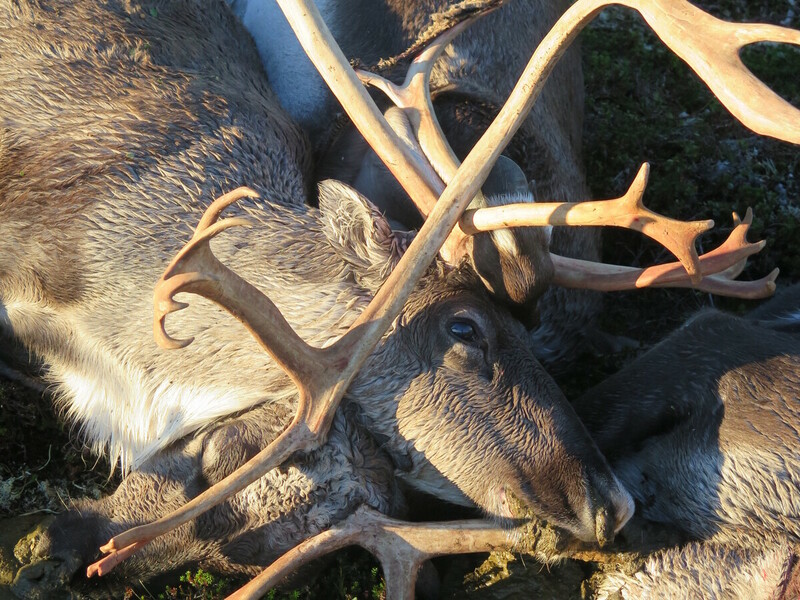 Although the animals don't appear to have died of illness, there was an outbreak of chronic wasting disease in a reindeer herd in northern Norway earlier this year that killed at least one animal. That case, in April, was the first known instance of chronic wasting disease in cervids in Europe, so wildlife managers are being extra careful. The neurological illness has killed portions of elk herds in North America, including in Colorado, Kansas, Montana, Nebraska, Oklahoma, South Dakota and parts of Canada. A previous version of this story incorrectly said that some 2,000 reindeer live on the Hardangervidda plateau. There are actually approximately 10,000.